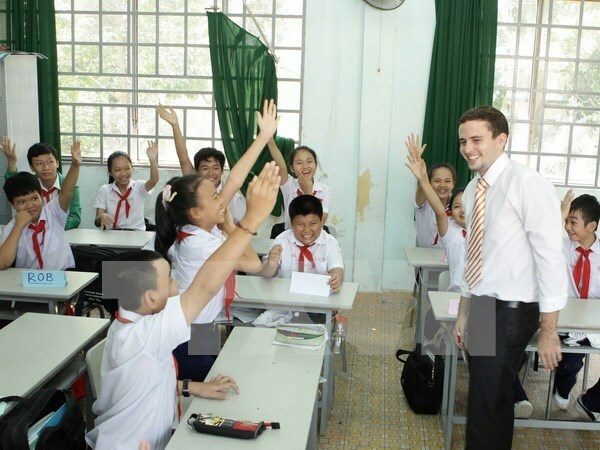 Hanoi (VNA) – Concerted efforts need to be made by the education sector to fine-tune the quality of English language teaching in primary schools, paving the way to meet the nation’s new education programme. After five years piloting the programme to teach English in primary schools, English lessons have been taught to over 4.62 million pupils in grades 1-5, accounting for 59.41 percent of the total primary students in the country, statistics from the Department of Primary Education under the Ministry of Education and Training (MoET) revealed. The programme has also pushed to increase the quality and number of English language teachers in the past few years. Last year, the country had 21,430 English teachers, rising 13.25 percent against previous year. In 2014, nearly 5,940 teachers achieved level B2 in English under the Common European Framework (CEFR), accounting for 31.37 percent of the total English teachers. The figure rose to 10,488 or nearly 50 percent of the country’s total English teachers in 2015. Deputy Minister Nguyen Vinh Hien said the programme has received a lot of public support. Numerous resources have been mobilised to improve teaching and learning quality, and improvements to facilities have had a positive impact on English lessons, he added. However, the English programme has been held back by a lack of teachers, and the education sector will need more time and financial resources to train English language teachers.